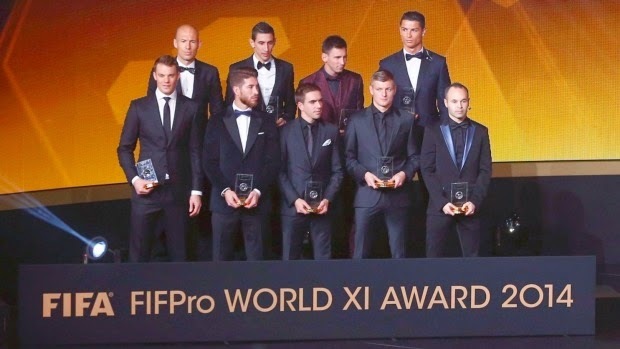 Here is the FIFA’s 2014 FIFPro World XI team line up at the FIFA Ballon d'Or award ceremony in Zurich. Back row, from left: Arjen Robben, Angel Di Maria, Lionel Messi and Cristiano Ronaldo. Front row: Manuel Neuer, Sergio Ramos, Philipp Lahm, Toni Kroos and Andres Iniesta.